Fits ALL Hoover FloorMate Models. This single Hoover FloorMate Filter keeps your machine working at its best for the cleanest possible floors. The part is simple to install and fits tidily into the FloorMate’s recovery tank. This is a Genuine Hoover Floormate Filter in Hoover Packaging. Beware of other merchants offering cheap filters they are shipping generic filters. Generic filters will void your warranty. These filters are genuine filters (Made by Hoover for Hoover) offered here at 50% retail prices. 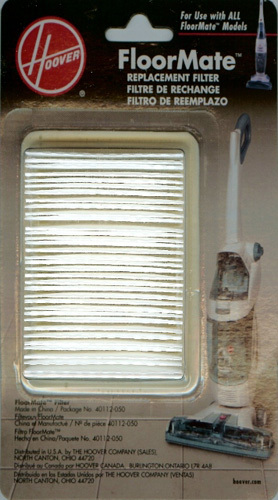 You will NOT find Genuine Hoover FloorMate Filters at a better price!